Posted on Friday, February 14th, 2014 at 7:11 am by Pieter van der Westhuizen. Microsoft Project is a product that not many people realize is part of the Microsoft Office family. It is also a product that most users do not have on their PC. Where you do see it, however, is on the computer of many project managers and herein lies the opportunity for us as Office developers. Let’s begin with having a closer look at the main object of Microsoft Project. Let’s run through them one at a time. The MS Project Application object contains a collection object called Projects. As the name implies, it contains a reference to all the open MS Project files. The Application object provides a property with which you can get a reference to the active project, called ActiveProject. 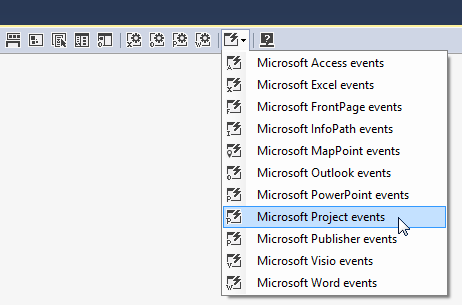 Use the project object as the starting point for most MS Project add-ins, because with this object you can gain access to almost all properties of the project, including resources and tasks. You will notice that in the above code, we also read properties such as task duration and resource cost and added it to the message box message. Microsoft Project helps project managers plan the timeline of their project by allowing them to enter the days and hours resources that are available to work on tasks. This information is stored on the Calendar property of the Project object. In the following code, we changed the calendar so that the only work days will be Wednesday through to Friday and the working hours for Friday will start at 10:30 and end at 16:00. You will notice that Visual Studio might complain that it cannot resolve the set_Working method of the WeekDay object. This is because this accessor method is hidden for an unexplained reason. You can still use it, because your code will compile. You’ll further notice a lot of places in the MS Project object model when adding things like views and tasks that it is not done by adding to a collection, but rather by using a method on the Project object. In this case we call the ViewEditSingle method to create a new view and the ViewApplyEx method to apply and activate the newly created view. Microsoft Project comes with a host of built-in reports. However, you can also create your own custom reports. 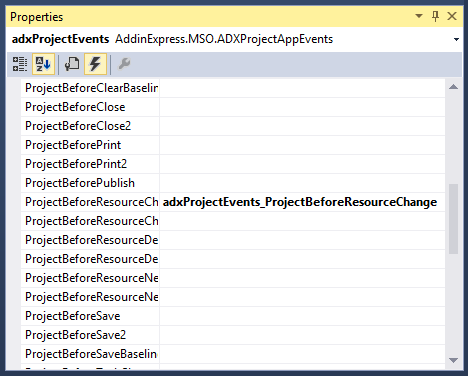 MS Project has an interesting way to create reports via the object model. Essentially you will create a report and add shapes to the report. Each shape in turn has a ReportTable object which contains the data for the shape. In the following code, we created a new report that will display the name and duration for all the critical tasks in the project. As a project cannot exist without resources, it certainly cannot exist without tasks. Tasks can consist of a single task or a summary task made up of a group of tasks. MS Project’s way to add a summary task, for a lack of a better word, is somewhat weird. One would think, you can add a new task to the Tasks collection of the Project object and set its Summary property to true, but the Summary property is read-only. Instead of adding a new summary task, you need to call the InsertSummaryTask method of the Project Application object. You’ll then need to get a reference to the ActiveCell in order to get a reference to the task associated with the cell. 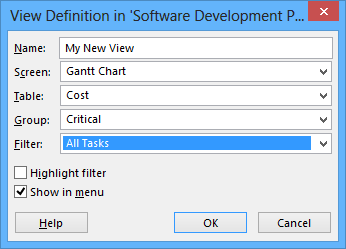 One caveat with this approach is that it assumes an empty row is selected in the current Task view. I could not find another way to create summary tasks using the Project object model. Adding a normal task is done in a more familiar and logical way by using the Tasks collection of the Project object. I went through your blog and tried to modify the MS Project 2007 calendar using C#. According to your code I am looking the changes in standard calendar. But it is not applying on my result task record. I mean to say changes are not reflected in Gantt chart section i.e. it is still showing sat/sun as non working. what is function to apply view in visual studio like we have ViewApplyEx in VBA. No such wizard exists. Note that although VBA and VB.NET are different languages, you use the same object model. That means, you may call ViewApplyEx from VBA or from VB.NET. Have you any idea how to get selected CELLS in a Project? Say, user selected ‘start’ of one task and ‘finish’ of another task – I need just these two cells. Is it possible? I almost broke Google finding the answer!! In the VBA IDE run this VBA macro and then open the Immediate window. You need to use the Macro Recorder to find this out. Start it and insert a new task. The Macro Recorder will create a VBA macro showing the classes/methods involved in the process. My problem is that I’m exporting information from my own app to MSProject and I want to show some hide columns by default. I’m writing information on the Text1, etc fields and I want to display it by default. Could you help me with that?? Thanks for your help and congrats for your blog, it’s hard to find good information about programming for project. You need to use the Macro Recorder to find this out. Start it and hide this and that column. The Macro Recorder will create a VBA macro showing the classes/methods involved in the process. How to implement Calendar.Period().Please help me ,I have stuck on this sort of code from last one week. It seems you are looking for https://msdn.microsoft.com/en-us/vba/project-vba/articles/calendar-period-method-project. I am new to VB. I download from SAP into Project and the Resource names column is populated with a resource work centre (eg.XNAB-P01). Most of the RWC’s have specific names which I have create a macro to convert but the XNAB-P01 RWC is a vendor specialist and could be any of 30 vendors. I need to find a way of changing the XNAB-P01 to the first word of the Task Name cell of the same row. It will need to be repeated for each cell with the XNAB-P01 RWC. I suggest that you start Macro Recorder (see the Developer tab), change one of the names, stop Macro Recorder and study the VBA macro it creates. The macro reveals the classes/members involved in the process. You need to use these classes/members in your code. Record more macros to find more details. I am facing one issue in Project VSTO addin. I would like to move one existing task from one parent to another parent grammatically. I heard that copy and paste is not good approach. I tried with copying ID to temp column and sort it. Issue: When I actually moved task, it shows in screen that it is under another parent but it keeps the parent child relationship with old parent.